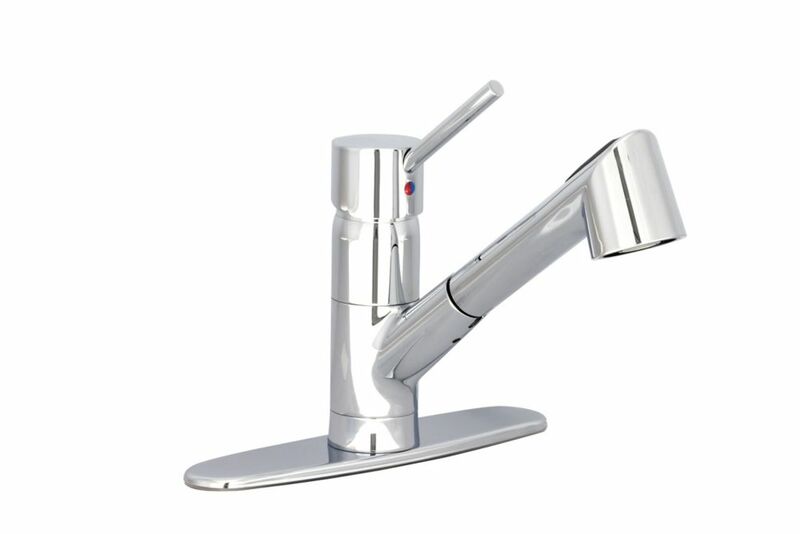 Kitchen faucet, modern style, in chrome finish. This single lever faucet has a solid brass body and a 2-function spray. The included plate allows installation on a 1 or 3-hole sink. For 3-hole kitchen sink (with plate) or single hole (without plate). Max. flow rate : 2.2 gpm (60 psi). Glacier Bay brand Keelia 8 in. top mount pullout kitchen faucet is designed to transitional style. Its single lever handle meets ADA standards for ease of use in adjusting water temperature and volume. The pullout sprayer features aerated and wide spray options, as well as a 48 in. braided hose for extended reach, making it ideal for filling large pots and pans or washing down the sink. Durable and bright chrome finish is good for kitchen decor. Freshly modern the Concetto single-lever kitchen faucet combines a sleek gooseneck design with high-tech functionality. The 1400 swivel spout incorporates a (pull-down) spray-head with locking spray control that allows users to transition between stream and spray modes with a simple push of a button. The lever handle benefits from GROHE SilkMove technology, which provides smooth and precise one-finger control of water temperature and volume. Concetto is offered in durable Starlight Chrome. K7 Kitchen Dual Spray Pull-Out Semi-Pro Medium 21-1/4 inch faucet height. GROHE designed the K7 line with cooking enthusiasts and amateur chefs in mind. Faucets that blend the functional performance of a professional kitchen with design sophistication, and with all the technological perfection you've come to expect of GROHE. The professional spray can be pulled out, turned and swiveled 3600 and operated with one hand. The high arch and 1400 swivel arm allows clearance for full-sink coverage when cleaning and filling tall pots. GROHE StarLight finish. The perfect assistant to at-home chefs, the K7 single-handle semi-pro kitchen faucet boasts pro-style functionality in an industrially chic design. Standing 26-1/2 in. tall, it makes a statement in any kitchen in both presence and usage. A key highlight is a professional spray head that pulls out and can be maneuvered 360 degrees for wide coverage. Locking spray control and a push button allow users to transition easily between stream and spray modes, and GROHE SpeedClean keeps the spray nozzles free of limescale buildup. When not in use, the spray head is held in place with an arm that swivels 140 degrees. A GROHE SilkMove for a lifetime of smooth operation cartridge in the lever handle ensures smooth, precise control of the water temperature and volume. K7 has a flow rate of 1.75 gpm and is available in brilliant GROHE StarLight finish for scratch and tarnish-resistant surfaces for a lifetime of beauty chrome, which is scratch-resistant and non-tarnishing. Single Lever Pull-Out Kitchen Faucet - Chrome Kitchen faucet, modern style, in chrome finish. This single lever faucet has a solid brass body and a 2-function spray. The included plate allows installation on a 1 or 3-hole sink.